Siliguri: The Hill Area Development Committee has decided to take up development works in the rural pockets of the hills at its first meeting in Siliguri on Saturday. The HADC, formed on November 22 last year, is headed by GNLF president Mann Ghisingh and comprises of other GNLF and Trinamul leaders from the hills. The committee has also proposed to set up two separate offices of the HADC, one each in the hills and plains. Mahendra Chhetri, vice-chairman of the HADC, said: "We have decided to take up small infrastructure projects like improvement of roads, extension of drinking water supply facility and other basic services in the rural areas of the hills, particularly the villages in the remote corners of the hills. We have planned to start interaction with local people to find out the gaps in infrastructure and bridge those through projects." Observers said the meeting of the development body just ahead of the chief minister's upcoming visit in north Bengal - Mamata is scheduled to arrive in Siliguri on January 8 - is significant. "It seems that the committee members intend to pass a message to the chief minister and her government that they are sincere in delivering their responsibility. They are well aware that the GTA is the principal body that has been functioning in the hills. So, they have planned to focus on smaller projects in the rural areas," said an observer. The Hill Area Development Committee has decided to take up development works in the rural pockets of the hills at its first meeting in Siliguri on Saturday. 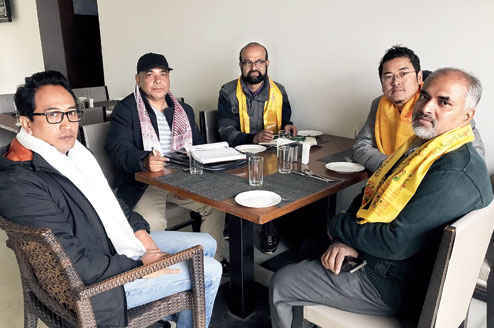 The HADC, formed on November 22 last year, is headed by GNLF president Mann Ghisingh and comprises of other GNLF and Trinamul leaders from the hills.